Last year in January, Gloria Sekwena was trying to register her son Kabelo for his first year in university. A nurse who lived in London, she had made the journey home to ensure that her son’s education would be taken care of. 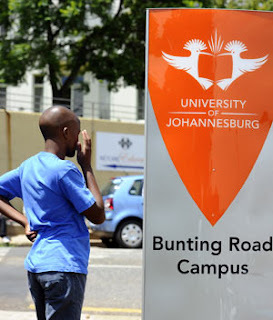 But in a tragic turn of events, a stampede that occurred outside the Bunting Road campus of the University of Johannesburg tragically took her life and left Kabelo without a mother. In a swift response to the tragedy, the University of Johannesburg gave Kabelo a bursary for his tuition, and Eduloan assisted with his accommodation, textbook and food costs. Eduloan caught up with Kabelo recently to see how he is getting along, and also to commemorate the positive contribution his mother made to his life. As part of our Women’s Month blog posts, we couldn’t think of a more fitting woman to place in the spotlight than this selfless mother. Eduloan: It’s been less than a year since you lost your mum – so the most important thing we want to ask you is how you are coping with her loss? Kabelo: It hasn’t been easy, but I’m trying my best to cope. My father came back from overseas and is staying nearby so I see him every day, and my brother is in Pretoria, so I do have my family here to support me. Eduloan: The fact that your mother travelled all the way back home just to make sure that you were enrolled in university shows what a high importance she placed on your education – as a role model, what other important values did she teach you? Kabelo: Honesty was a big part of her life and what she tried to teach us. Her faith, determination and a good work ethic were also the values that she taught me. She did believe very much in education; she said education was important to open doors and find opportunities in life. She was a strong believer that studying would broaden our horizons. Eduloan: We believe that you are studying Biomedical Technology – why did you choose this field of study and what are your plans for your career after you have finished studying? Kabelo: Yes, I’ve always been interested in the medical sciences. My studies form part of a broad spectrum of medical sciences, such as genetics and haematology, which are the aspects of the course that I most enjoy partaking of. Ultimately, my dream is to work for an organisation like the CDC (Centre for Disease Control) in Atlanta, USA. Eduloan: How are the studies going? How did you find your first year at UJ? Kabelo: It’s been difficult, but I hope I’m doing ok! My finals are coming up soon and I think that I will get good results. Eduloan: What do you believe could be done better in future to prevent problems arising from the large numbers of people trying to register for university? Kabelo: I heard that next year they are planning to have a centralised application process, which I think will be better. Eduloan: Do you have any words of wisdom for how the youth could appreciate their elders, and especially their mothers, more? Kabelo: I’ve learnt that when you lose someone, you don’t notice how much of an impact they have on your life and how important they are until they are gone, and it becomes too late. So I would say respect your elders and appreciate them while you have the chance.